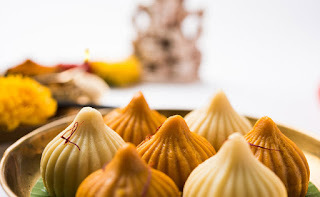 About Modak Recipe | Modakam Recipe: Lord Ganesha's favourite sweet, Modak are sweet flour dumplings stuffed with coconut, jaggery, nutmeg and saffron. This modak recipe is a steamed verison, which is also known as 'ukdiche modak', however there is a wide variety of this Indian dessert which includes fried modak as well. A popular dessert from Maharashtra which is consumed highly during the festival of Ganesh Chaturthi, Modaks are now made in many parts of the country as well. Due to Lord Ganesha being 'Modakpriya', the one who likes modak, 21 pieces of modak are served as the offering after the puja during ganesh chaturthi. The easy recipe, rich flavours of nuts and saffron, all of this appeals to our taste buds and make this dish an irresistible one. You can also try these different modak recipes that we have.